This white flesh fish with very few bones and pricks is every family’s favourite. Best to serve steamed with light soy sauce to preserve the original flavour! *Gutting & Scaling reduces approximately 20% of the weight. Known as Peh Ngor or Ngor Her Soong in Hokkien language; Senangin or Kurau in Malay. Although the fourfinger threadfin can grow up to 2m in length, the usual length is often around 50cm or smaller. The table-sized fish is often farmed so it is often good to ask if the fish is wild caught as the wild variety often tastes better. The fish is silvery on top with a creamy yellow belly. Why Fourfinger? How is it different from Premium Threadfin? The easiest way to identify this Fourfinger Threadfin is to count the threadlike filaments under its gills. There are four, hence its name. the diameter of the eye is also greater than the distance between the eye and the snout. So compared to the Premium Threadfin, the eyes are proportionally larger. This fish can be steamed or fried whole and braised in a sauce made of soya sauce and ginger or black beans and chilli. Fourfinger Threadfin are great for steaming and they are often found at either Teochew porridge or Bak Kut Teh stalls selling Teochew style steamed fish. The heads are usually chopped up and fried with bittergourd at Zi Char stalls. The flesh is firm and can be used for fish and chips as well as grilled and served with garlic butter. 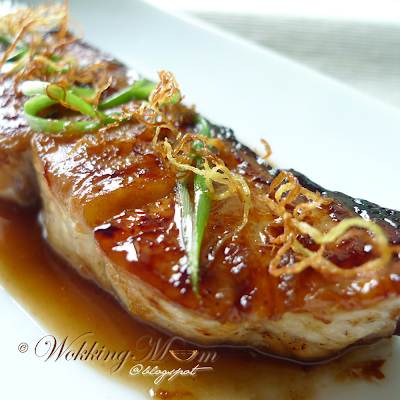 Marinate threadfin in ginger sauce marinade for half an hour. Drain threadfin and place in pan. Pan fry on all sides on medium high heat till just cooked, about 10-12 mins. Using the same pan pour in ginger sauce for seasoning. Bring to a gentle simmer. Drizzle over threadfin or use it as a dipping sauce.